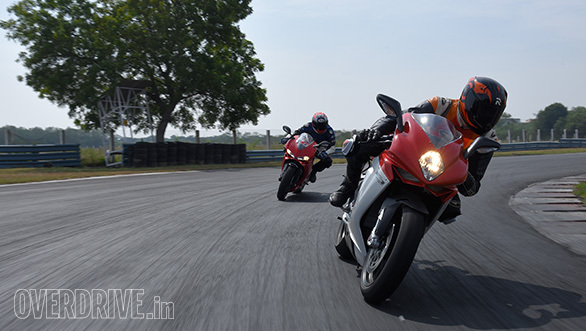 The Ducati 959 Panigale roars down the stretch between Turn 3 and Turn 5 at the Madras Motor Race Track with a restrained fury that I know well. I'm tucked in watching the rev counter's digital bars count off the revs before a shift light prompts me to gently boot the quickshifter to select a higher gear. But Mody's lighter as well as faster and he has the MV Agusta F3 today. What the MV lacks in outright performance, Mody makes up for in smoothness. The silver-red blur passes me on the inside as I start hunting for the braking marker. Mody hits the brakes a moment later than me, and I'm treated to the sight of the MV weaving gently as we both shed speed and prepare for a complex that we both know well and like immensely. The Ducati is effortless. Light but firm pressure on the bars sends the 959 on its side. At just 176kg dry, the 959 feels light and, honestly, tiny underneath you. It is a slippery motorcycle though, and finding a secure place to lock your knees in when cornering takes work. But this is a stable, stable motorcycle that works rather well on its Pirelli Diablo Rosso Corsa tyres. The 959 slices through the first part of the complex carving a sharp, accurate line before I lightly pick it up and slam it the other way for the long corner that is Turn 6. The MV is on its side as well but I can tell that Rishaad is having to work just a smidgen harder to keep the F3 feeling as secure and planted as the 959. Another quick flick-flack and we are on the top loop of the MMRT. A never-ending corner that leads to the back-straight, the fastest part of the circuit. Here, then 959 has a distinct advantage. Its linear power, stable poised and friendly electronics all come together, and in theory I can pass Mody in many places during this long curve. But no one is giving trophies away. What a difference! The F3 feels larger when you first straddle the motorcycle thanks to the extra width of the 3-cylinder configuration. But the riding position is very different from the Ducati. The Panigale's bars feel a fair distance from you and the tank is extremely narrow. It makes for an intimate riding position where you feel connected and tucked neatly in to the motorcycle. and the front wheel feels like it is directly under you. It establishes a most direct, clear line of communication that remains one of my most vibrant memories of this impressive motorcycle. Through the same section, the MV feels as grippy as the 959 but not quite as stable. The first hard braking will put some sweat on the brow, for starters. The F3 likes to weave gently when you're hard on the brakes. It will reliably, predictably do this into every corner, and you just have to get used to this. In the middle of the corner, the traction feedback is clear but the power delivery is a lot less linear than the Ducatis, especially at smaller throttle openings. This makes stabilising the chassis a little harder work at high lean angles than the Ducati. But the punch of the 3-cylinder is a strong and urgent. It takes a while before you notice the extra power of the 160PS Ducati - the MV weighs about the same but makes 148PS, 12PS less. The jumpier power delivery makes the MV feel more invigorating to ride. As if you wrestled a bigger, more aggressive alligator. 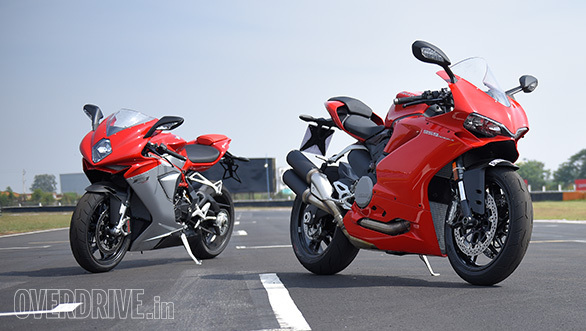 But the truth is that the Ducati 959 Panigale is the vastly friendlier motorcycle of the two. It has almost no lumps or jumps in its power curve, and acceleration is predictable and progressive as the revs climb, which makes riding fast easier no matter what your skill level happens to be. The 959 we tested did have the brakes with less bite although they don't lack for power or fade. I've ridden 959s with vastly better brakes, so I'm going to assume that this unit had pads that had glazed over or needed a once-over. But both of these motorcycles are sharp, fierce little creatures. And rather well-matched in overall ability. The two areas where the differences are pronounced are design and electronics. Let's talk about the electronics first. The Ducati 959 dates back a year while the MV Agusta F3 comes from 2013 - a new MV F3 incorporating all the juicy new bits from the updated Brutale 800 should come to motor shows end-2017. This is obvious in the electronics. The Ducati 959 stops just short of the IMU-equipped traction-control system but has everything else. It gets three riding modes and you can alter the default settings in each mode (except for engine power and throttle response) to set the motorcycle up to your liking. You get to select between three ABS and Engine Brake Control modes each and eight levels of traction control. The engine brake control, specifically, makes a huge difference. The system injects a small amount of fuel into the cylinders when you have the throttle closed to reduce the chassis pitch change that comes from compression braking. 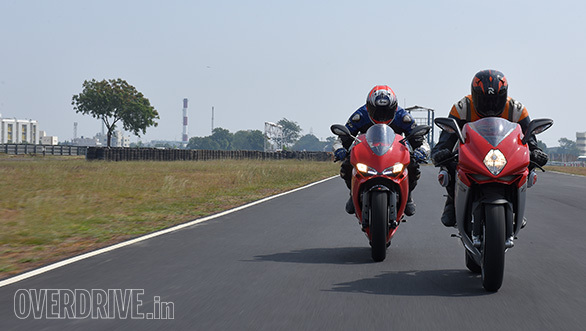 In the default setting - Sport mode, EBC 2, the dive is pronounced and the Ducati feels a little too on-off. 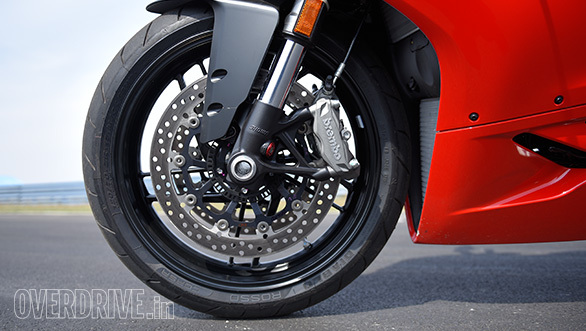 But raise the EBC to 3 - maximum intervention, minimum pitching, and the Ducati feels vastly friendlier, a lot more like an inline-four with light compression braking. The cherry on top is that the Ducati system isn't the easiest to use - take a bow Aprilia - but it took me less than five minutes to alter the settings. This is on the basis of the fact that I have seen Alessandro Valia do this once for me at the first ride in Thailand. The MV system has fewer settings but working with the system will drive you around the bend. The screen you look at is an old-feeling blue-lit low-res screen with jagged-edged fonts. And the switch set on the left grip you use is just atrocious. Forget gloved hands, it is ridiculously hard to press any of the four buttons accurately. The systems aren't very different in intervention either. The Ducati system is impressively well-mannered. Interventions are rarely dramatic enough for you to notice them. The helping hand arrives smoothly and you just about feeling brush past you as it solves a problem you've created. The MV system is effective but a lot more heavy-handed. It makes you less likely to rely on it because you don't like the way it feels. Inasmuch, the F3 is showing its age. You can bet that the updated 2017 model will show a dramatic improvement in this regard  vehicle electronics is a fast-moving world right now. The other area and the really sticky one is design. Neither bike can claim to be new. But the MV F3 is a generation older in design. And to good reason. Massimo Tamburini's lines are near perfect, and I would find it hard to imagine that updating them will be easy for the company. That said, evolution and fresh styling complement each other, and the F3 looks older and less well made. That second bit continues to surprise us. 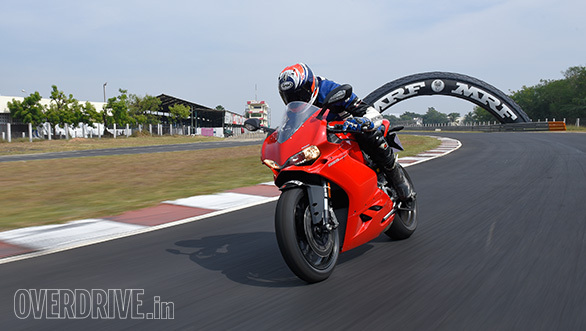 Neither the F4 R we tested earlier nor the F3 feels as high quality as the Ducati. The 959 relies heavily on the Panigale stylebook and wavers only in the exhaust which are Euro-IV compliant and, to most eyes, shatteringly ugly. But the Panigale design is not a very old one, and Ducati's quality is at a very high level and whether you nit-pick on the finish or the build, the 959 Panigale passes muster. But back to back laps, pit lane chatter and all reinforce the basic thought that everyone who rode both the bikes felt rather good. The difference between the two is subtle. In nature, the MV feels angrier and jumpier. This means you have to ride with greater skill or you will find it harder to ride - these are two sides of the same coin. The Ducati is vastly friendlier. You won't feel as connected to it as the MV Agusta F3, but the stable frame, silent electronics and the oh-so-linear power delivery allow new hands to exploit the performance while allowing older hands to have enormous headroom to ride ever harder. So which one should you buy? That would be the Ducati. The reasons to buy the MV Agusta is a smaller set. First, the MV Agusta is Rs 1.5 lakh more than the Ducati 959 Panigale, and outside the design and the value of the brand name, this is a hard price difference to justify. Performance is similar and the 959 is actually faster as well as newer in design. Second is that aggressive feel. If that's something that ticks your box, you will find the 959 a little too subtle for your taste, I guarantee it. The Ducati 959 Panigale is the more persuasive supersport here. It's generally quicker than the MV Agusta almost everywhere on the track. It also happens to feel vastly more robust as well as like the motorcycle that will not bite your head off if you make an error. This is critical to the proposition that a lot of new riders will experience 160PS performance from the Ducati early in their riding careers. 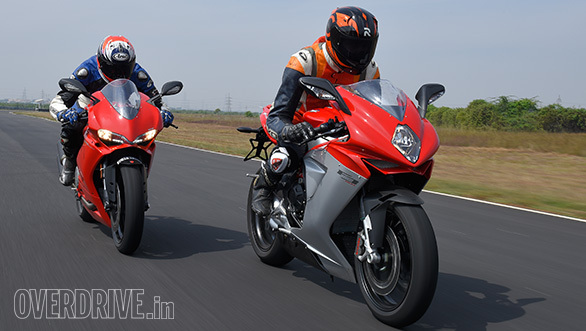 The favourable price difference  the Ducati is Rs 18.46 lakh 0n-road Mumbai  sweetens the proposition. The final reason to pick the Ducati is not directly from the racetrack - the Ducati has the higher handlebars which makes it easier to ride slower over longer distances. The Ducati is not only a critical smidge more practical, it also happens to feel vastly more mechanically robust than the MV Agusta. I get confirmation when Rishaad and I both decide to head out for a few more laps later in the day. And we both reach for the Ducati key, realise it and smile knowingly at each other.